High levels of triglycerides can increase the risk of heart disease. Triglycerides are the fat found in our blood and work to provide the body with energy. Extra triglycerides become stored for a future date when they are required. Numerous research has suggested that high levels of triglycerides increases the risk of heart disease. Triglycerides form from the finished product of digestion and come from the fat and carbohydrates which we consume to turn into energy for the body. Triglyceride levels are tested with a lipid panel which is a similar test to how cholesterol levels are checked. The Centers for Disease Control and Prevention estimated that high triglyceride levels are a problem for nearly one-third of Americans. A rise in triglyceride levels has been seen over the last 30 years and yet only 1.3 percent of those with high levels take medication to lower them. 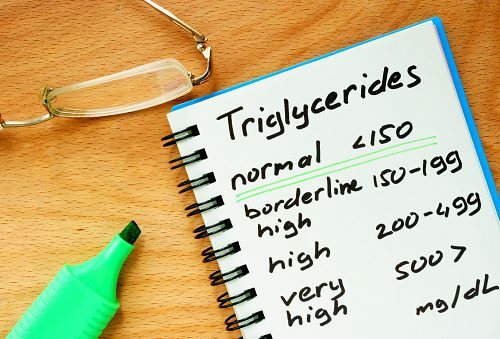 This reveals that more attention must be played to triglycerides as high levels can have serious consequences and so more should be done in order to lower them – especially for those at high risk for heart disease. Coronary artery disease is a common form of heart disease and high levels of triglycerides can contribute to it. Research from the Broad Institute suggests that lowering triglycerides can be an effective means in lowering the risk of coronary artery disease (CAD). So far LDL cholesterol (bad cholesterol) is a known factor for heart disease and lowering it through the help of statins has been shown to help reduce a person’s risk of developing heart disease. HDL, on the other had, has always been thought to be a factor to help reduce heart disease but no connection has been found on how HDL can help improve CAD. The research team looked at 185 variations in genetic coding which have been shown to be linked with blood lipid traits. Single nucleotide polymorphisims, or “SNPs,” are inherited by one or both parents. The researchers then looked to see if SNPs affected LDL, HDL, triglyceride levels and CAD risk then compared the effects. The researchers found an association between triglyceride levels and CAD similar to that of LDL and CAD. LDL cholesterol forms plaque along the artery walls and so the research believe that triglycerides may work in a similar fashion by depositing fat along the arteries. Although cholesterol and fat are essential to the body maintaining normal levels are essential as high levels increases the risk of serious health problems, specifically to the heart. Dietary cholesterol and triglycerides come from consuming red meat and dairy products. When these foods are consumed they become absorbed through the gut and dispersed through the bloodstream to reach the liver where they become processed. This is how the liver can develop non-alcoholic fatty liver disease because a diet high in fat and cholesterol makes the liver become fatty. It is the liver’s job to deliver cholesterol and triglycerides to the body on top of producing about 75 percent of the cholesterol found in the body. Although triglycerides and cholesterol are similar in the sense they are types of fat they do possess differences. A main difference between cholesterol and triglycerides is that cholesterol is used to build cells and certain hormones where triglycerides store unused calories and provide the body with energy. Another difference is that cholesterol is largely affected by the fat which is consumed through diet where triglycerides are affected by total calories. Excess calories are turned into triglycerides and stored for when the body requires energy. Items like alcohol and sugary foods can have a larger impact on triglyceride levels. Having high LDL cholesterol and triglycerides can raise serious health concerns and so it’s important to boost HDL and lower triglyceride levels in order to maintain proper health. Here are some tips in order to raise HDL levels and lower triglycerides. Eat a moderately low-fat diet – a moderately low-fat diet has been shown to be more effective at lowering triglyceride levels as opposed to a strict low-fat diet. The AHA recommends that 25 to 35 percent of your daily calories should come from fat. By following these tips and working close with your doctor you can have much success in lowering your triglyceride levels and protecting your heart. Is your cholesterol affecting your memory?